Proven Experience and Quality Service Positive Word of Mouth. We provide quality work and client service and this is why 80% of our clients come from referral– which is what sets us apart from the competition. We encourage and build solid relationships – Our customers are of paramount significance to us. We build our business relations on trustworthiness and reliability, making sure that our relationships last for many years. Our professional cleaners are going to do everything possible to satisfy all of you requirements. What helps our company to grow is reputation and how important ‘word of mouth’ is. 80% of our yearly business come from recommendation and at the same time we are seeking for new clients. How we achieved this by always putting the client first. 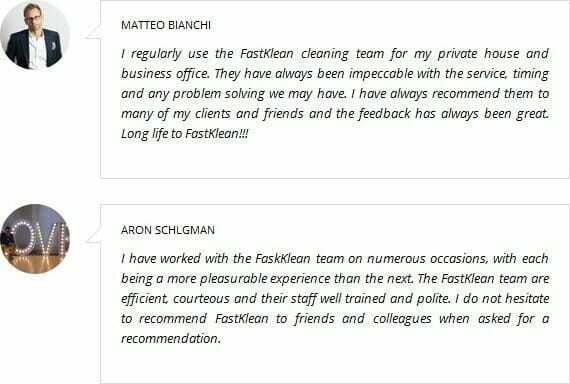 We will listen to you and your wishes, and give you a realistic estimate on how we think we can make manage your account and cleaning requirements. We are receptive an we stay engaged in a project during the whole process. Our service is performed on time and it is very affordable, too. To find out more about our prices click here. Our cleaning company doesn’t do “one size fits all”, but rather tailor solutions to a customer’s requirements, focusing completing the job right. After Sales Service and Customer Satisfaction – Our commitment to you does not end with a certificate. We aim to go beyond the expectations of our clients, so we can completely satisfy their individual requirements. We have created new software specifically designed to monitor the cleaners’ time schedule. The software’s sole purpose is to supervise all of our operatives’ arrival and departure time from clients’ premises. As a registered client, you will be able to discuss your needs with your Client Manager at all times. We give you one dedicated contact for the whole process: Your very own Account Manager. Any problems, your contact takes care of them; leaving you free to get on with the rest of your job. We will establish and carry out periodical quality control checks so a high standard of service is maintained at all times in order to meet your expectation and satisfaction. Nevertheless, we have an established customer complaints procedure in place and all cleaning staff and management are aware and have been trained to handle complaints in a professional and courteous manner. We have always aimed to encourage, value and manage diversity in all areas of our business and to be an equal opportunities employer. We are up-to date with the very latest professional products and techniques. We are fully accredited members of different organisations – learn more. For more information about our professional cleaning company in London give us a call today on 020 8884 9149.